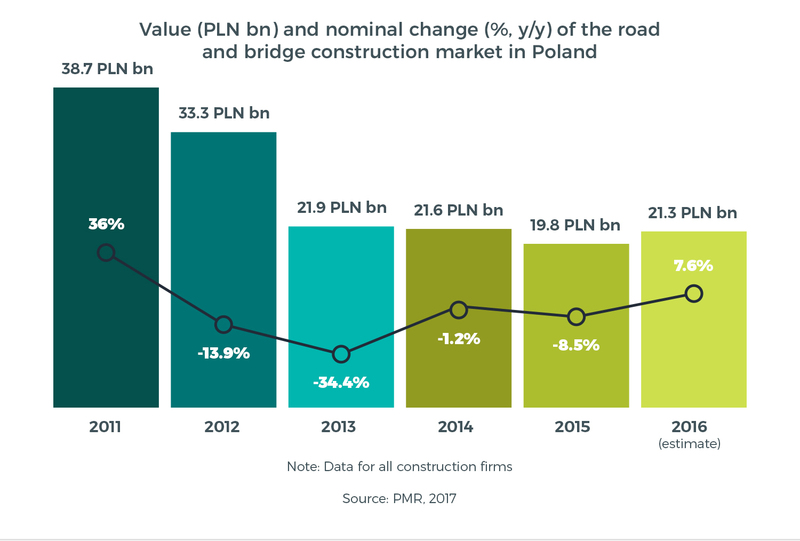 After four consecutive years of declines, the Polish market for road construction (including road bridges) moved back into positive territory in 2016, growing by a single-digit number to surpass PLN 21bn. This is still PLN 17bn less than what it was worth in record-breaking 2011, though. We expect that the market will grow again this year to reach nearly PLN 24bn, but that a more robust recovery will begin only in 2018, thanks to an increase in investment activity by local governments. It should be noted, however, that the high level of indebtedness of Poland’s biggest metropolitan cities will act as a damper on further road and bridge construction market growth, as many mayors are forced to look for budgetary savings.